Emory University's Nell Hodgson Woodruff School of Nursing was ranked 4th in the nation according to US News and World Report's 2018 America's Best Graduate Schools. The ranking is a jump from 8th last year and commemorates the first time in Emory's history that any school has ranked among the top five. "It is truly an honor to be recognized within the higher education and broader community as one of the very best nursing schools in the nation," says Linda McCauley, PhD, RN, dean of the Nell Hodgson Woodruff School of Nursing. "I am grateful to our dedicated faculty, students, staff, and alumni for their hard work and their continuous commitment to excellence, which helped to distinguish our program in an extremely rigorous and competitive process." The school has a long-standing history of educating women and men to be leaders at the forefront of health care. With bachelor's, master's and doctoral degrees, it is recognized as a premier institution focused on health promotion, disease prevention, health maintenance, education and research. 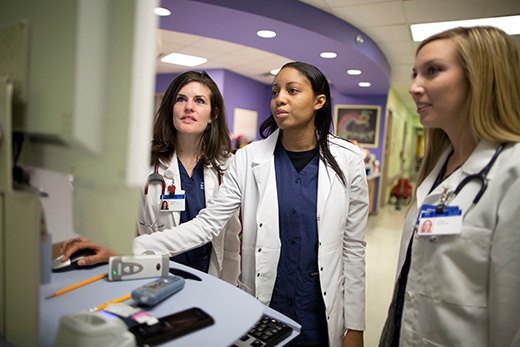 Now with specialized programs, partnerships and unique training and mentoring opportunities, the school has grown to address the unique educational needs of its students and their diverse patient-care interests. "Emory's graduate and professional programs are consistently recognized as among the best in the country," says Emory Interim Provost Stuart A. Zola. "This reflects the excellence of our faculty, the commitment of our academic leaders, and the high quality of our students. Atlanta and the world benefit from Emory's strengths as a leading research liberal arts university." The school's Family Nurse Practitioner program also increased from 10th to 8th in the list.